Meg, at bottom, with some of her students in Venice. Each summer, Meg takes college students on a whirlwind tour from her home base of London to Amsterdam, Bruges, Paris, Lucerne, Venice, Florence, and Rome. Growing up in the suburban Midwest, Meg McClure Tynan envisioned herself living a glamorous city life. Ever since her first trip to Europe at 18 with the Sound of America choir, she was “single-mindedly focused on getting back whichever way possible.” Today she lives in London with her husband and her cat, continues to sing her way across Europe, and experiences "that euphoria that people get when they come abroad for the first time over, and over, and over again." Meg and her brother Tim at the Alhambra. Now, they enjoy traveling together, but growing up, their age gap could be a challenge. Meg recalls, "My brother, Tim, is almost nine years younger than me so when there was a baby or a toddler at the house, I just wanted to escape." There was before we moved to Michigan and after. In middle school, I was kind of a nerd. I had friends, but I was never the popular girl. My first year at high school in Chicago, I was so, so happy. I’d made so many new friends. [After the move] I was miserable. I just didn’t fit in. I didn’t make friends very easily. To this day, I only really have a couple of people that I’m in touch from my high school days. I wasn’t a very happy person in those years leading up to college. I wasn’t universally an enthusiastic student, but the classes that I felt that I excelled in, I always tended to try to find mentors and seek out mentors in those subjects. I took the English Language AP test without taking the class, and my teacher just gave me kind of a guidebook, and said, “I know that you can take this in your sleep. You’re very talented” and I got a 5 on that and was able to get college credit for it so that was a bit of a personal triumph. Although I look back and see myself as a bit of a sad teenager, actually I found a lot of joy in music and part of that was because we moved and I wasn’t quite as social as I had been. What role did the performing arts play in your high school experience? I think being a little bit unhappy and maybe being a little bit awkward socially made me throw myself into them more. We had this absolutely amazing choir director named Dr. Jackson. He was a real mentor to me. Throwing myself into music … really gave me inner confidence. I look back now, and I realize how lucky I was to have that in my life, and to have parents who supported me in my music, and paid for me to have voice lessons, and drove me around the state to have competitions and stuffs. Although I look back and see myself as a bit of a sad teenager, actually I found a lot of joy in music and I would say part of that was because we moved to Michigan and I wasn’t quite as social as I had been in Chicago. I also was very privileged, I must say, when I was a teenager. I went to Interlochen Arts Camp for a summer the year that I turned 16. I was majoring in operetta and choral performance so I just got to sing six to eight hours a day, six days a week. It was basically heaven. You first got a chance to travel abroad with the Sound of America Honors Band and Choir when you were 18. How did that come about? My choral mentor, Dr. J, Dr. Jackson, had basically opened it up to anybody that we could audition for state honors choir as teenagers. Once you were chosen to be a part of the honors choir, you got recruited to audition for this ensemble that went abroad and so I was able to do that and that was the summer after I graduated from high school. That was the very first time that I ever went outside of the US apart from a trip to Toronto, and that trip was just life changing. [It] was visiting six countries as a performing artist in about the course of a month and all of those countries just fascinated me, but especially Italy. It still just gave me a taste for the bigger picture and the world outside of suburban Midwest. After high school, you went to Michigan State University. What was college like? That summer abroad really turned me on to Italy so I decided to study Italian, take Italian lessons when I was at Michigan State and although they don’t offer an Italian major, I had enough credits by the time I graduated four years later to have had a double major in English literature and Italian. I really enjoyed the Italian lifestyle. It was just a totally different way of living than what I was used to. What was it like studying abroad in Florence, Italy compared to your whirlwind trip after high school? I’d come to Italy because I really wanted to experience Italy so I would spend quite a lot of time just sort of roaming around Florence at the weekend and Florence is quite a small place. I joined a local choir. I volunteered at a local charity. I met lots of sort of local Italians just through spending time there at the week and just hanging out, but that was also life changing in a way because I really enjoyed the Italian lifestyle. I loved the slower pace of life. I loved that everybody had a really long lunch break, occasionally had a glass of wine with lunch. I loved that it was more of pedestrian lifestyle and a lot of my friends that I made over there didn’t have cars. It was just a totally different way of living than what I was used to. How cool that you joined a choir! Why did you decide to do that? I like to sing anyway, but I just thought it would be an interesting way, not only to meet new people, but also to see inside some really great venues. I ended up joining the Choir of the Duomo, and it was just amazing to sing inside that building, and just to hear the sound resonate. After you graduated, you returned to Florence. How did you find a way to move there? When I was 20, 21, I just wanted to get over there and my Italian professor at Michigan State hired me as her teaching assistant. I came abroad as her teaching assistant. So that was the good launching pad that I needed. It was a job to get me overseas and then once I was there, I found a job in a hotel and then I found a career job in Study Abroad. How did you come to work in study abroad? When I was in Italy, my second job was becoming the assistant director of a new study abroad program in Florence. So Florence being a study abroad mecca, I kind of fell into this career because it was something that was up and coming at the time and it keeps growing, keep creating more programs. You spent several years in Italy, in Florence, then Rome, and got a Master’s degree in between. What brought you to London? I moved to London in 2007. I did find an Italian company who sponsored my work visa on the basis that they wanted someone native English speaking in their office [in London] and it was a customer service role for an Italian website, but they also needed someone who was proficient in Italian so I was able to get a visa based on my language skills. And then, when that visa was running out, I happened to meet a handsome man on the train and we’ve been married almost six years now so that was how I ended up staying in London. Now you’re a Programme Coordinator for the American Institute for Foreign Study. What does that role entail? Do you work directly with students or with other adults? Meg arranges internships for American students in London. It’s a combination of planning and operations so I do help plan some programs. What I primarily focus on now is an unpaid internship program. One of the main things that I do is I connect American students coming to London with unpaid internship opportunities. In the summertime, I’m also a tour manager. I lead a touring program in European art and architecture and we go from London to Amsterdam, Bruges, Paris, Lucerne, Venice, Florence, and Rome so I still get paid to travel for a living, which is just excites me to no end. I love experiencing that euphoria that people get when they come abroad for the first time over, and over, and over again. I love experiencing that euphoria that people get when they come abroad for the first time over, and over, and over again. It’s really great to travel with my students in the summer program. I would say the vast majority of them haven’t been outside of the US before. Outside your job and spending time with your husband, you spend a lot of time with your choir. What keeps you singing? When I first came to London, my initial aim with singing was just to have a bucket list of venues that I wanted to perform in. In the UK, particularly in London, there are lots of sort of amateur and semi-professional opportunities for singers and other musicians who are good, but who also have day jobs. So when I first moved to London, a friend of mine that I’d known from the days that I lived in Italy was a part of a choir, and invited me to join the choir, and it wasn’t the best choir in the world, but I had lots of fun with them and I’ve toured all around the UK with them. it’s really important to just figure out where you find your joy and always keep that a part of you. Singing is clearly an activity you care a lot about. What advice would you give about pursuing something you love that isn’t a job? Whenever I go to choir, I always feel so good after I’ve had a sing, so I think that it’s really important to just figure out where you find your joy and always keep that a part of you. Even if it’s something that’s small that you do on the side, you’d be surprised, that can transfer to a different culture or a different setting and those things can be universal. What would you say to someone who feels like you did in high school? “Things will get better.” You’re not going to be 15 forever. You’re not going to be in high school forever. Following through, and making it to the end, and accomplishing something, and then moving on really sets groundwork for later on your life. Anybody who gets a job will tell you, and even me, who loves my job, there’s always going to be that 10 percent or that 5 percent that you don’t necessarily want to do, but you have to do. Making that commitment to yourself that you’ll follow through and finish something even if it isn’t making you that happy, it’s important. I don’t think it would’ve ever occurred to me that I would’ve moved abroad. As a teenager, what were you hoping adult life would bring you? I don’t think it would’ve ever occurred to me that I would’ve moved abroad. I think I saw myself traveling a lot in my 20s, which I did, but I think I envisioned myself living a glamorous city life, being a metropolitan woman who took public transport, and wore a black leather jacket, and had lots of important meetings with people, but I don’t think I necessarily envisioned myself in another country. Any last words of wisdom for someone who wants to live a life of adventure? Just keep an open mind. It wouldn’t have occurred to me when I was 16, 17 that I would move abroad and I don’t think it even would’ve occurred to me that I would be traveling so much internationally right of college, but when the opportunity arose to audition and to perform with that tour when I was 18, that kind of came out of nowhere. I think it’s important when you’re a teenager just to keep an open mind and to start thinking about opportunities as coming from anywhere, really. Meg and I are actually third cousins. Our grandmothers were first cousins who grew up more like sisters. They spent most of their adult lives as working women, but when they retired, they saw the world! Together, they traveled to Japan, Hong Kong, Morocco, Egypt, Israel, Greece, and through the Panama Canal. Their adventures seemed wonderfully exciting to me as a little girl, and no doubt helped spark my own love of travel. 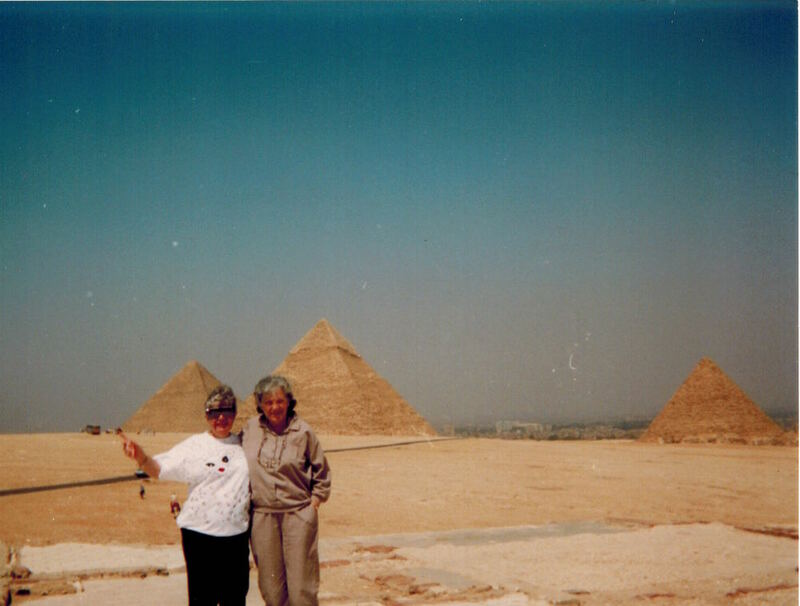 Meg and I agree that they probably would’ve loved the freedom to travel that we had as young women. They were always excited to hear about our travels, and never more than when we traveled together. Check out books Meg loves and find out more about her life and work!